The British government brought down their 2012 Budget yesterday. I haven’t had time to fully digest all the detail yet and I am not yet fully conversant with all the discussion papers that underpinned the official budget documents. My experience tells me that one usually finds some really interesting points that are hidden in the fine print of some of the less obvious government documents. Sometimes these points are “game makers”, which really expose the ideological slant of the budget. Not that you have to do much digging in this budget to determine what agenda the British government is now pursuing. The “bond markets are about to close us down” rhetoric is giving way now to Thatcherite “trickle down” stories. This budget is trying to sell the “puppy” that if more real income is transferred to the rich then they will ensure, through their enhanced enterprise, that the poor (which cedes real income) will eventually be better off. That is a variant on the “fiscal contraction expansion” myth. Which tells you that they didn’t like it. I will analyse the budget strategy in detail in another blog but the Chancellor’s speech was so full of lies and distortions that I wondered how he could keep a straight face. Which is exactly true as a summary of what happened and as a statement of how you get out of a balance sheet recession. The only problem is that it was the private sector that borrowed too much and are now not willing to maintain the level of credit-funded spending. Further, under these conditions, the British economy is not going to earn its way out of the problem because there are no clear growth engines present – private spending flat, net exports flat, and public spending going negative. The 2012 Budget was in one sense pretty much a non-event from a macroeconomic perspective – the Chancellor called it a “fiscally neutral budget”. It is hardly “neutral”. It continues the plans of the past two years of reducing net public spending which will undermine real growth in Britain. In that sense, its “neutrality” is that it didn’t accelerate the pace of austerity. Upon my first reading, however, it marked quite a change in rhetoric – from fear campaigns about solvency and default and what the bond markets would do to the economy – to a class-based bias towards the rich at the expense of the poor. The trickle down effects of shifting the balance towards the rich would somehow benefit the poor who now had further burdens placed on them by the withdrawal of benefits etc. … thinks that the super-rich deserve lower taxes while pensioners should hand back more to the Treasury. He believes business ought to get a helping hand through lower corporation taxes, even while Britain’s army of 2.7 million unemployed got barely a mention. When the British government came to power I wrote that its austerity rhetoric was just a smokescreen. The real agenda was to finish off the Thatcher push to demolish the welfare state and create a pool of desperate workers who would always be prepared to undercut each other and thus keep real wages growth down. The beneficiaries of this strategy is of-course the high-income and/or wealthy elites. It was interesting to read the Bloomberg article (March 21, 2012) – U.K. Conservatives Come Up Short in Austerity Experiment – by the relatively mainstream economics writer Clive Crook. It was written before the 2012 Budget was disclosed. Since 2010 Britain has been a laboratory for an important experiment in economic policy. The question: When economies slump and public borrowing soars, can fiscal restraint speed the recovery? Preliminary findings: No, and whatever made you think it could? Which I detect is a trend starting to emerge among more mild mainstream commentators – the rejection of the fiscal contraction expansion which has driven the British “experiment”. More significantly, Clive Crook makes some telling points about the options that the British government has. The unemployed weren’t asked whether it was all right with them, but Britain was a good place for the experiment. For a start, its government actually controls fiscal policy … Britain had another advantage. Like the U.S. but unlike France or Germany, it has its own currency and runs its own monetary policy. Osborne doesn’t have to frame his budgets knowing, as governments in the euro area know, that interest rates will be set somewhere else according to somebody else’s needs. And that is tells you that the British Chancellor lies to the British people when he makes out that the fiscal austerity was the only way that they could have lower interest rates. The truth is that the Bank of England (a part of the consolidated government sector – see The consolidated government – treasury and central bank) and sets the short-run interest rate in the UK and can control longer rates at will. Further, the British government “has its own currency” which means it can always ensure that spending growth is sufficient to fully employ its workforce. Unemployment above the frictional level (people moving between jobs) is always a policy choice by the currency-issuing government. Never be deceived into believing the neo-liberal myth that somehow unemployment is determined by the “market” with workers’ preferences for work and leisure largely driving the outcome. Currency-issuing goverments determine overall unemployment by not spending sufficiently in relation to the purchasing power taken out of the econmomy in the form of tax revenue and the desire of the non-government sector to save. Clive Crook clearly understands that “Britain therefore had a lot of freedom to get fiscal policy right when the recession bore down in 2008” and by following the austerity route the British government has undermined private sector confidence. … didn’t happen. Britain’s households aren’t spending, and its businesses, despite running big financial surpluses, aren’t investing. For the past 18 months output has been essentially flat, still well below its level when the recession began. Official forecasters think output won’t regain its 2008 level until 2014 — a slower pace of recovery than Britain experienced after the Great Depression. And even though the “Bank of England has been more forceful than the Federal Reserve in supporting the economy with quantitative easing”, taken together, “monetary and fiscal policy are still doing too little to support demand”. I would point out that quantitative easing has not been stimulatory because it was predicated on a false assumption that the banks needed reserves in order to increase lending. The reality is that banks are not lending because private demand for loans is weak as a result of the extreme pessimism among households and firms. Please read my blog – Quantitative easing 101 – for more discussion on this point. I also liked Clive Crook’s attack on the so-called public private partnership mentality that permeates neo-liberal governments and has been show in many nations to be a failure. He says that the British government is banking on the private sector becoming involved in “privately financed infrastructure spending” as a major source of growth. You just have to see the forecasts in the Table below to see how much they are banking on a major recovery in private investment to drive growth. … is a fine idea … But it’s crazy to finance what is public investment in all but name through private borrowing when the government can borrow long-term for almost nothing. Britain does need to spend more on infrastructure. Now is the perfect time to finance this through higher public borrowing. Not only would it spur demand, but in the end it would cost much less. I agree that him that such approaches to public infrastructure development are crazy and driven by blind ideology. The facts have never fit the rhetoric. Please read my blog – Public infrastructure 101 – Part 1 – for more discussion on this point. The standard attack on PPPs has been somewhat misleading. The argument goes that the private sector has to price its debt in the market whereas public debt prices at the long-term bond rate. Given that there is typically a 3-5 per cent difference between private and public funds, the PPP can never be cheaper unless services (employment) are cut dramatically or construction quality reduced. However, we have to recognise that the difference in borrowing rates reflects project risk and lower public rate implies that government will rescue a failing project via drawing on consolidated revenue. Therefore the PPP is constructed by its proponents as an efficient transfer of risks from public to private and the critics are dismissed as being ignorant of this “risk transfer” argument. The gains are alleged to arise from the private sector being better able to manage risk – largely because they have a higher incentive to do so – private profit. The real problem with the PPPs in this regard is that is a falsehood that the risk shifts from the public to the private sector. Who ultimately bears the risk? The risk premium in private financing is based on the fact that a private entity can become bankrupt with its product and service exiting the market. With an essential public service it is a fantasy to say that the PPP contract transfers risk to the private sector. If the private partner defaults, the public always has to pick up the pieces. There is no real risk transferred. There is substantial empirical evidence, particularly from the UK that shows that PPP partners in the private sector profiteer from the “risk” transfer component built into the contract payments. The private provider aims to minimise financing costs over the life of the contract by early repayment and refinancing existing loans at lower interest rates. The risks are typically high in construction phases and drop to near zero once service operations begin. The private partner reduces costs by refinancing at lower rates once construction is completed. The private partner captures these gains at the expense of the social good. The PPP contract may be able to prevent this from happening but then it reduces the incentive of the profit-seeking private provider to enter the contract. The problem is that the concept of making private profit on public infrastructure is in our viewed a flawed one. Why should the public payments include a profit margin? Is ownership or management the key to sound project outcomes? This is a rehearsal of the privatisation debate which failed to show ownership mattered. Finally, Clive Crook’s mainstream biases come out in his final assessment – that “a milder and longer-delayed fiscal adjustment than the one Cameron and Osborne devised was possible, and would have been smarter”. With a substantial real GDP gap still present in the UK there is absolutely no case for any cutbacks in public spending. Britain needs a long period of budget deficits to allow the private sector to reduce its debt exposure back to more viable levels while growth ensues. The private sector will not suddenly spend the British economy out of trouble given its current debt levels. So with growth in public spending forecast to be zero this year and then contracting for the following 4 years, the growth engine will stall as it has. Here are some preliminary calculations based on the data presented in the British Budget papers and data released by the Office of National Statistics. Between the March quarter 2000 and the June quarter 2008, the British economy grew at a rate of 3 point 1 per cent per annum (that is, real GDP). For the next 6 quarters the economy contracted at an average rate of 4.2 per cent per annum. By the December 2009 quarter, real GDP was £17962 million (or 5 per cent) below the June 2008 peak. The 2012 Budget documents contain the latest forecasts, out to 2016 from the Office for Budget Responsibility. The 2012 forecasts are considerably more pessimistic in the near-term than those presented in the 2011 Budget papers. However, the OBR still thinks the British economy will get back to 3% growth rate by 2015 under current policy settings. The following Table (Table 1,1 from the 2012 Budget paper) shows the summary national accounts forecasts that are embedded in the model of HM Treasury in framing the Budget. I consider the forecasts for 2012 and 2013 to be overly optimistic given current policy settings. You can see that in 2013 and beyond government spending will contract and they are assuming will be more than offset by substantial growth (unrealistic) in private investment in capital goods and housing. But in the exercise I will go through next, I assume the forecasts will be correct. In fact, by adopting the OBR forecasts I am effectively presenting the best case scenario, unless you want to argue that the OBR is being excessively pessimistic. 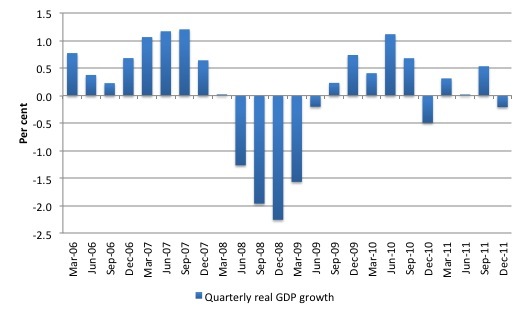 The following graph shows the actual quarterly real GDP growth from March quarter 2006 up to the December quarter 2011 (blue bars). The depth of the recession is clear as is the stimulus-led recovery that began in the March quarter 2010 and gathered pace through to the September quarter 2010. The current British government took power in May 2010 and once the private sector had absorbed the austerity message growth began slowing in the December quarter 2010 and has been deteriorating since then. The UK Office of National Assessments (ONS) latest National Accounts data is up to the December quarter 2011 and showed that the British economy (real GDP) contracted by 0.2 per cent in the fourth quarter of 2011 as the weight of the austerity climate that the Government has imposed is starting to weigh expectations down. 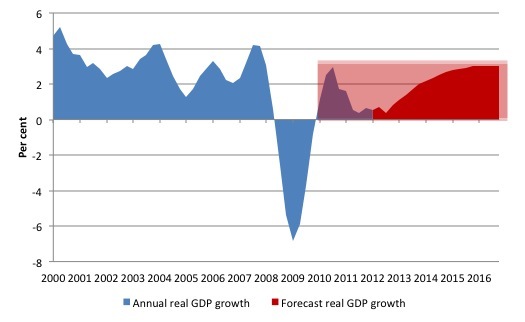 The next graph takes a longer perspective (from the March quarter 2000) and shows the actual annualised real GDP growth rate up until the December quarter 2011 (blue area) and the OBR budget 2011 forecasts (red area) up to 2016. The forecasted quarterly observations were extrapolated in a linear fashion in such a way to be consistent with the annual OBR forecasts. I decided to come up with a rough measure of the fiscal austerity cost expressed in terms of real GDP. Assume that from March 2010 which was the first quarter in 7 that the British economy had shown growth, the average from 2000-2007 (3.1 per cent per annum) was maintained to the end of 2016 (the current budget forecast period). The pink rectangle captures this assumption – so an average real GDP growth rate of 3. 1 per cent (from March 2010) would trace out a line consistent with the top of this rectangle. The Fiscal Austerity Loss in real GDP terms, taking the optimistic OBR forecasts at face value (that is, the best case scenario), is the pink area above the rectangle-enclosed blue and red areas. What is this cumulative real GDP loss between March quarter 2010 and the December quarter 2016 equal? Answer: £595169.8 million. By the December quarter 2016, the British economy would be some 8.3 per cent smaller than it might have been had the stimulus-led growth continued at the average 2000-2007 annual rate. That is, the British economy would be sacrificing some £33,000 million in lost real GDP in the December quarter 2016. Any other expression but “a staggering loss” would be an understatement. Progressive groups in the UK should be performing calculations such as this (there are many ways to go about such an exercise) and push their results out as widely as possible. I will have more to say about the 2012 British Budget at a later date once I have examined all the individual discussion papers that underpin it. What I can say is that it relies on the private sector to increase its debt level (and burden) for the growth forecasts. There are two points to make about that: (a) it is unlikely to happen; and (b) it is madness as the economy struggles to extricate itself from a severe balance sheet recession to be withdrawing public spending support for growth and the private deleveraging effort that has to take place before the private sector will take responsibility for growth. That strategy will compound the fragilities that pushed Britain into the severe 6-quarter recession and eventually fail. Although fail in this context is in terms of my goals (stronger employment, increased equity, sustainable growth) whereas the agenda of the British government doesn’t appear to be remotely about that. In real people terms that 1,700,000 people who cannot ever have a job or a living income come what may under this economic system. In graphic terms that’s a population the size of the cities of Birmingham and Leeds combined. How can we continue to support an economic system design that literally sacrifices that number of people and refuses to compensate them for their loss? very good spot I was looking for that, thank you. Again a good Post Bill. The more MMT I read, I realise that the ‘left’ and the ‘right’ are just as bad as each other. They take one another’s mess and make it worse – without fail. One interesting pre-budget announcement was the absorption of the Post Office pension fund into the government finances – in order to facilitate privatisation. It seems that the fund assets have reduced government “debt”. Yet the “future liabilities” have miraculously vanished – presumably as the Treasury doesn’t recognise future claims as being of relevance today (as with everyday public system pensions). Is this a partial recognition of MMT realities? Or have I got it wrong? It is a recognition of realities. And it shows you how all private pensions should be dealt with. Rather than having a load of Gilts paying interest to a third party annuity provider, the government should just cut out the middleman and pay a state earnings related pension directly to the individual on top of the state pension. That would save the farce of building up a load of government financial assets to pay pensions and getting people excited about ‘debt’ that isn’t. What is really amusing is that if the government did this at least a third of the so-called ‘debt’ would instantly disappear. But you never see that option discussed on Jeff Randall. The page I look at is the one titled ‘Central government account’. That has the current expenditure on it and shows the fiscal year to date. That shows that interest payments and net social benefits are up, even as other current expenditure and investment is down. Because it is the monopoly issuer of the currency, the government of Canada can never run out of money. The implications of this are profound: there should never be unemployment since sufficient government spending can always close the demand gap and provide work to all willing job seekers. In 1935, our federal debt as a percentage of GDP (gross domestic product) was already 75 per cent, but we did not surrender during the Second World War because Canada could not afford soldiers. By 1945, as a result of huge military expenditures, the ratio of debt to GDP had soared to 132 per cent. Yet in the postwar years, far from cutting back, the government built infrastructure, welcomed immigrants and introduced many new social service programs. With an economy running efficiently, the debt ratio dropped by 1970 to 40 per cent. Anyone who says the government is in such dire financial straits today that it must cut services and must fire employees does not understand economics and does not know history. Yes unemployment is a large problem, along with low wages and high living costs. I wonder if you have considered the very open nature of the EU labour market (immigration into the UK).It seems new jobs go to immigrants. If the UK government was to stimulate, this may not reduce unemployment in the UK. I feel we are constrained by the EU more than we are told. You have to be careful about the cause and effect there. Immigration increases the productive capacity of your country and is generally of net benefit – as long as it is managed in the correct way for the benefit of all the existing population. If the UK government stimulated via a Job Guarantee then it would eliminate unemployment by definition. The question then is whether the EU freedom of movement policy would cause unsustainable levels of immigration that place too much stress on the public infrastructure. I agree with Neil above. I would add that the UK government could base eligibility for Job Guarantee based on how long a person has lived in the UK, rather than nationality. This would mean that UK nationals returning to the UK would be treated the same as foreign nationals arriving for the first time. Increasing the amount the UK pay in by, say, £1Bn should ensure we get whatever agreements we need.